Today there was an opportunity to vote on bringing the ERA up for a Vote. We were not alone in showing support for the ERA. ***** To be clear, today’s vote was about IF the ERA should be voted on. ***** The Aye votes – 10, Nay votes – 15, Not Voting – 4, Vacant – 0. 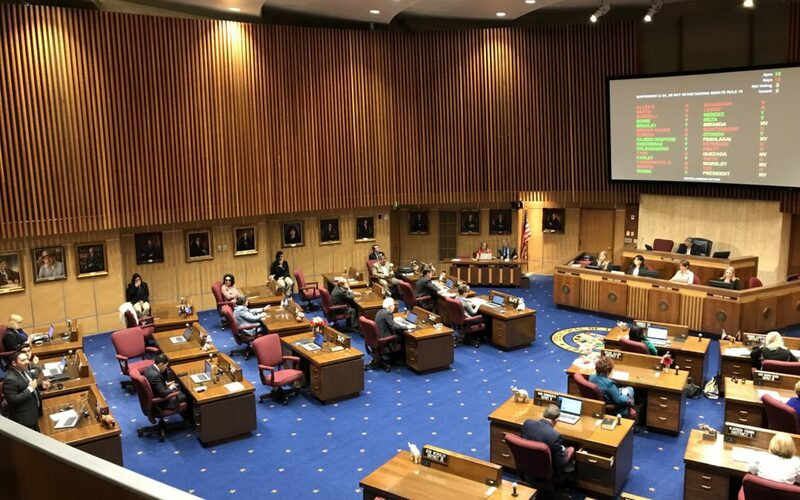 These results demonstrate there will be no vote on the ERA in the AZ Senate this session. From Left to Right: Paula Cullison, Akanksha Mishra, Kathryn Mitchell, Rivko Knox, Dianne Post, Anne Pyron, Rebecca McHood, Anissa Rasheta, and Meg Abhau. Pictured above is Senate Minority Whip Quesada speaking in favor of voting on the ERA. ACTION: Send your thank you’s to the following Senator’s for standing and speaking in support of the ERA: Minority Leadership Hobbs, Minority Leadership Assistant Farley, Minority Whip Quesada, Dalessandro and Mendez. We find it ironic the birds have left their comments at the front door of the AZ Senate Building.